SAVIGNANO ON THE RUBICONE. The 2 October 2016 marks the beginning of the season for the newly promoted La Saponeria Unigross which runs into a defeat against Castelvecchio, a decidedly more highly-rated and expert team. 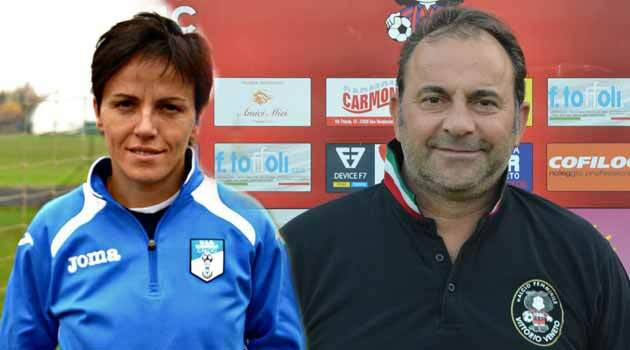 At the Old Town Hall of Savignano sul Rubicone the match ends with the result of 4-0 in favor of the owners. First half substantially balanced with opportunities on one side and the other but it is Emilia Romagna to find the way of goals with Zani. In the second half the Pescara try to regiacre the result but without too much luck and, with the doubling of Guidi, the game is channeled towards the victory of the Castelvecchio that realizes two more networks always with Zani and Guidi. Filed the defeat the Pescara are already with the head to the next league game where they will host the Padua. in the Herforder and in the Duisburg, then military in Spain in the Espanyol in Barcelona and in the sporting Club de Huelva in Seville.The last month convoked in the new national under 23 of mister Amendola. Good luck from the girls, the staff and the presidency. It is made. 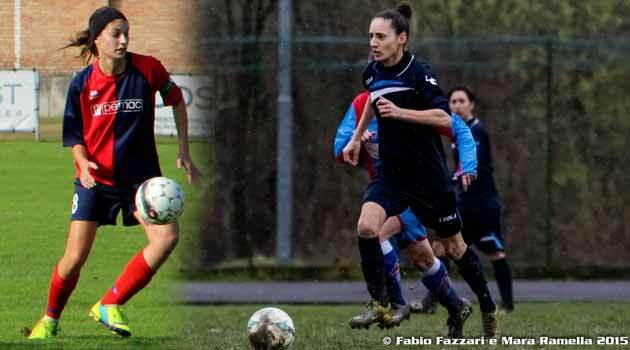 Extreme defender Simona Cazzato is coming. 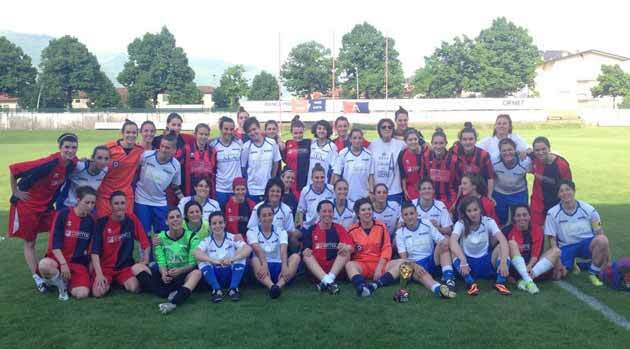 After exactly 16 years since the founding of the company the top Cs Franciacorta women's football, in the meeting of the extraordinary assembly of members of the 15 / 6 / 2015 unanimously decided to close the company. Lidia Gandossi has always been president: "It is closed, certainly not for economic problems, one ends healthy society became an important reference in the football movement of Brescia and elsewhere, which over the years has carried around the country with honor and pride the name of Erbusco reaching, always in the field, sports and image goals beyond any more rosy forecast. It is not the intention of the company to assign the category right to others because it is in the same thought that the results must be achieved in the field The category that we leave, the only reality in Brescia to compete in the national championship series B, involves an organization that does not it depends exclusively on the forces of society, the difficulties encountered in logistics and training spaces as well as the non-possibility of expanding our activities have been a source of reflection. .
TRANI - A golazo by Serena D'Amico gives Salento Women Soccer the stay in the national championship of women's Serie B. E 'was a feat of the captain of the formation of the Giallorossi to decide the derby against Apulia Trani valid for the final play out of group D of the cadet tournament. A draw would have been enough to ensure another season in national football but at the end of a race fought from start to finish the team of coach Mannatrizio had to surrender in front of the desire to win the Salento. "It was not easy at all to conquer the municipal Trani packed like in a match of the men's C series championship - emphasizes the match-winner - having only one result available to remain in Serie B we took to the field with the idea of make us the game because we were sure that our opponents would take care more than anything else to not let us play, as then happened on the field. 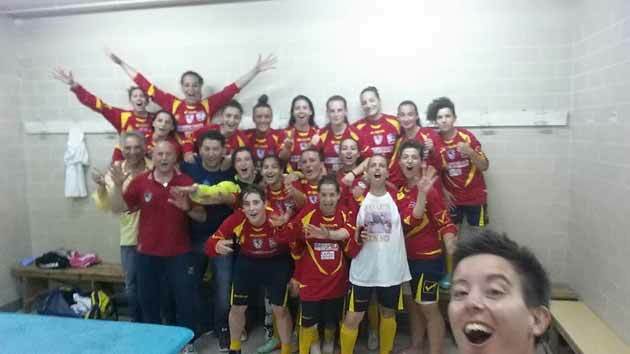 It is the Luserna of Tatiana Zorri to win the recognition of the best team in the 2015 B series. The municipality of Vittorio Veneto is vicious, proving to have something more than the Venetian especially from the point of view of experience. It was a great party, as only women's football can give away. The two technicians gave the whole rose, and the most deserving young, the ideal catwalk for the great season just ended. It was for many the first taste of Serie A, and of course he had the best, the team with the most elements that the A series have already experienced extensively. Needless to say, it was a pleasure to host the sympathy of the Piedmontese girls and staff. Several prominent individuals, and the two technicians wanted to reward the day as MVP, for the class Luserna, the leadership of its captain Manuela Bosi, finally returned to the only championship that truly competes: the series A. 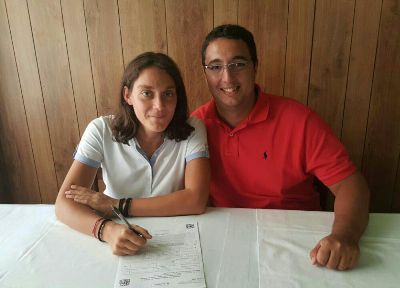 For Vittorio Veneto unanimously all the Piedmontese staff rewarded the fantasy of the rossoblu juggler Giorgia Cisotto. Sunday 10 May at 15.00 are played the play out of the cadet league. 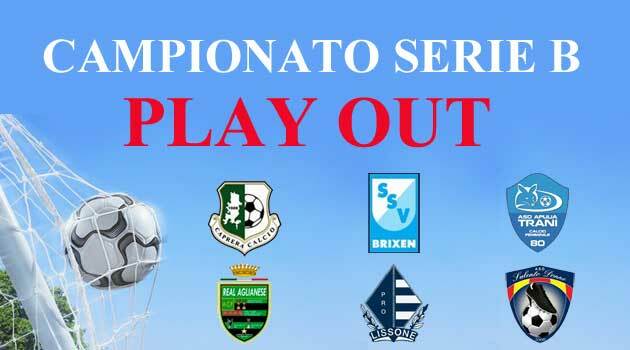 In group A, Caprera hosts Real Aglianese; in group B, Pro Lissone will face away the Brixen and group D, Apulia Trani will host the Salento. Thanks to the regulation, in the group C the play out is not disputed and the two Monti goes directly in the company of Net.Uno Venezia. After today's Serie A championship that will elect the Italian champions, tomorrow, eyes focused on the play out with the races dry not to recede. The editors of calciodonne.it makes a big good luck to all the contenders and ... of course .. the strongest win! For the Luserna, SARA MASSARELLI class 89. He started playing football when he had 15 years in Chivasso that after a couple of years would become the Real Canavese Chivasso, born from the merger between Chivasso and Real Canavese. With Real Canavese he won the Serie C championship. 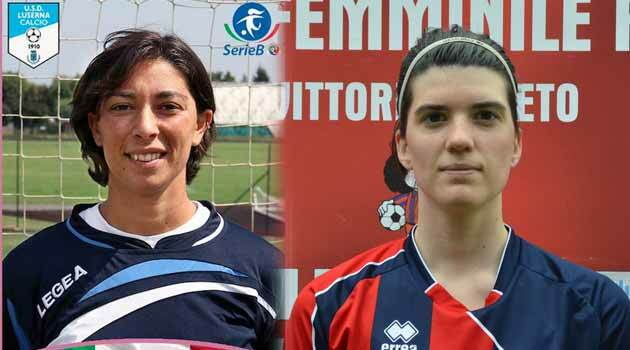 Loose Real Canavese passed to Juventus Femminile doing 2 years of spring and a year of Serie B. Before joining Luserna he had a one year break at Cit Turin in the Serie C championship. Then he finally arrives in the 2011 / 2012 in the Luserna where he now plays for 3 years. After seeing the promotion last year and with the inclusion of new purchases this year it finally managed to win the championship by scoring 22 appearances and 2 goals. For Vittorio Veneto, the pillar of defense and captain GIULIA DA RE (91 class). The most representative player, the one who best embodies the Rossoblu spirit. She was born and grew up in football with the Rossoblu shirt, always tattooed on the skin. A life as a central defender, but willing to accept this year the tactical revolution, desired by the Mister with the advancement in midfield, in the heart of the game. Vittorio Veneto - Luserna (Sunday 10 May - 16.00 hours) - Protagonists of the confrontation on the defensive departments of the two teams promoted in A, are two charismatic characters and leader for both dressing rooms. 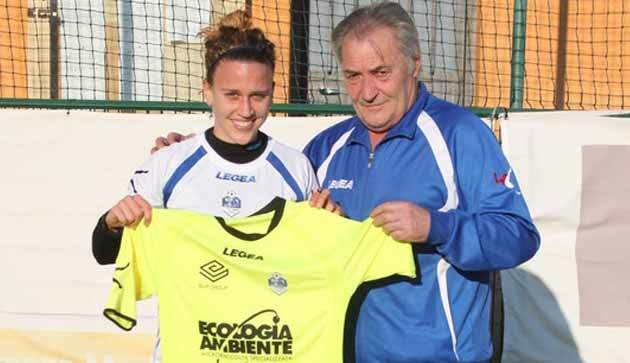 For the Luserna MANUELA BOSI born the 13 / 04 / 1981 in Voghera (Pv). The teams in which he played are in order: 10 years in Alexandria doing all the categories (c, b, a2), 7 years in Turin (A), 1 year again in Alexandria (a2), before the final transition to Luserna 2 Years ago. His contribution has been fundamental to center the promotion in Serie A, both in terms of experience (he has several appearances in Serie A), and for his remarkable qualities as absolute leader in directing the entire rearguard, not disdaining even to be a few gifts on goal in terms of goals scored (3 this year and 4 in the last season) For Vittorio Veneto, the vice captain FRANCESCA DA ROS (03 / 01 / 1992), grew up under the protective wing of the great guru of the Claudio Foffano victorious football in the men's team of San Michele Salsa. Then start immediately in the female Vittorio Veneto and then dress, always and only that glorious jersey, contributing to the growth and formation of the historical group and guide it to the amazing annual goal.